ValenciaValencia.com is the most comprehensive online travel guide to Valencia, a one stop tourist guide for all Valencia tourist information. 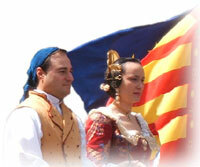 ValenciaValencia.com is an independent resource created by travellers for travellers. We bring you the most reliable Valencia information on the web: all of the reports on this site come from direct and up to date first-hand experience and not from other tourist guides to Valencia. Our mission is to bring you the unbiased and accurate tourist information you can trust - meticulously checked, tried out and uncompromisingly dedicated to the beneift of the traveller, with no concern for any other parties. Highlights: City of Arts and Sciences, Turia Garden, Holy Grail. Tourist attractions, top sights of Valencia and other sights, galleries of sights. Top museums of Valencia and other museums. Map of all central sights, maps of suggested walks, suggested itineraries for 1-4 days. Getting around and guides in Valencia. Beaches in the sity and within a short trip out of the city. Busy beaches, undeveloped beaches, nudist beaches. Getting to the beaches, maps, gallery of the beaches, general advice. Where to stay, all hotels in Valencia - by area, all backpacker hostels in Valencia - with a map. Some short-term flat rental companies. Travelling to Valencia: airport and airlines, port and ferries, bus station and coach operators, train station and rail info. Getting around valencia: bus, metro, taxi, car rental, bike rental. Tourist information offices, banks, internet, phone centres, post, laundry, guides, translators and interpreters. Dishes of Valencian cuisine and tapas. Listings of restaurants by cuisine and by category. Listings of tapas bars. Map of central restaurants. Working hours, tips and budget eating. Traditional Valencian culture. Las Fallas. Semana Santa of Valencia . Flamenco in Valencia. Corrida in Valencia. All Valencian fiestas, fully explained. Fairs and festivals in Valencia. Art Museums, galleries, theatres, cinema, classical music in Valencia with a map. Bars, Clubs and Pubs of Valencia. All nightlife areas of Valencia fully covered - with an overview, listings of the best places in the area and an interactive map of all places in the area.